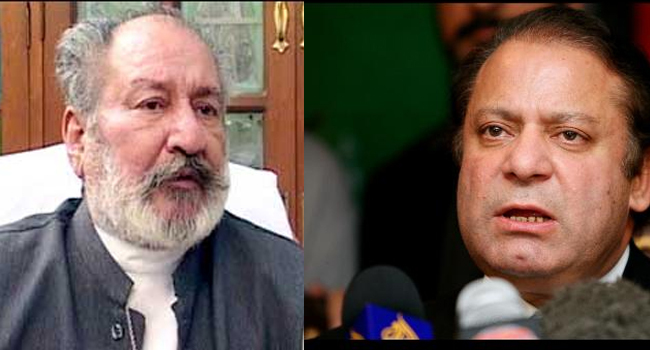 Pakistan Muslim League-Nawaz (PML-N) President Nawaz Sharif failed to meet Pakistan Muslim League-Functional (PML-F) President Pir Pagara at the hospital, where the latter is under treatment, because, apparently, the doctors are not allowing him any visitors. Sharif arrived for a three-day visit in Karachi on Monday. He was scheduled to meet Pagara at the private hospital where the PML-F chief has been under treatment for around a fortnight. The PML-N leadership had informed the F-League of Sharif’s intended visit to the private hospital for meeting Pagara. When Sharif and other N-League members arrived at the hospital, Pagara’s son/PML-F Sindh President Pir Sadruddin Shah Rashidi welcomed them at the private wing of the Aga Khan University Hospital. Rashidi thanked Sharif for visiting and then informed the PML-N chief that Pagara would not be able to meet the delegation because the doctors have forbidden the PML-F chief from meeting anyone. Sharif told Rashidi that Pagara is a major political personality of the country, adding that the F-League’s president is his senior. He said he holds Pagara in high regard and had visited the hospital because he had heard Pagara was under treatment there. Sharif handed over a bouquet to Rashidi and left the hospital without meeting or even seeing Pagara. On the other hand, sources said Pagara is not ready to meet Sharif yet and he had made up the excuse that the doctors are not allowing him to meet anyone. They said while Pagara is under treatment at the hospital, he is not forbidden from having visitors. It is pertinent to mention here that from time to time, Pagara has been vocal about his opinion of Sharif, and has openly criticised him on many occasions. Separately, Punjabi Pakhtun Ittehad President Irfanullah Marwat has announced on Tuesday that he is joining the PML-N.
What has he gained from the 3 days stay in Karachi. A meeting with Ataullah Mengal was highly publicised out-of-propotion.Pir Saheb refused him even a courtsy – let alone political discussions. A much awaited and publicised meeting with Mehars and Jams etc couled not happen. IT CAN SAFELY BE CALLED AS AN EXCURSION TRIP.